1. 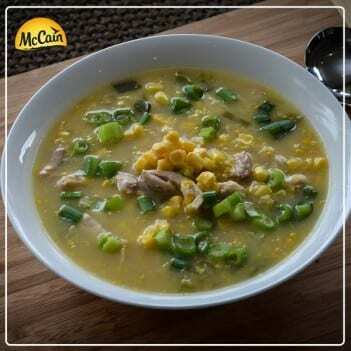 Place the chicken stock in a large saucepan with the soy sauce, ginger, McCain Frozen Corn Kernels and creamed corn. 2. Cook over medium heat and simmer for 5 minutes. 2. Add the chicken and green onions and cook for 3-4 minutes or until chicken is cooked through. 3. Serve sprinkled with extra chopped green onion. 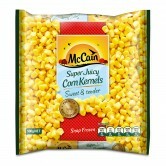 1 Place the chicken stock in a large saucepan with the soy sauce, ginger, McCain Frozen Corn Kernels and creamed corn. 2. Cook over medium heat and simmer for 5 minutes. 2 Add the chicken and green onions and cook for 3-4 minutes or until chicken is cooked through. 3 Serve sprinkled with extra chopped green onion.